Historical Novels Review "A chilling start...fans of the modern Gothic novel will enjoy filling up a few creepy hours." Kirkus Reviews "A novel of chilling romantic suspense that evokes the lost era between the world wars that so wounded the lives of the young men and women of England, and adds to the mix an inevitably dark, gothic ghost story. Read it with the lights on. Simply spellbinding." Susanna Kearsley, New York Times and USA Today bestselling author of The Winter Sea "A compelling read. With a strong setting, vivid supporting characters and sympathetic protagonists, the book is a wonderful blend of romance, mystery, and pure creepiness. Simone St. James is a talent to watch." Anne Stuart, New York Times bestselling author of Shameless "Compelling and deliciously unsettling, this is a story that begs to be read in one sitting. I couldn't put it down!" Megan Chance, author of City of Ash "With a fresh, unique voice, Simone St. James creates an atmosphere that is deliciously creepy and a heroine you won't soon forget. The Haunting of Maddy Clare promises spooky thrills and it delivers. Read it, enjoy it--but don't turn out the lights!" 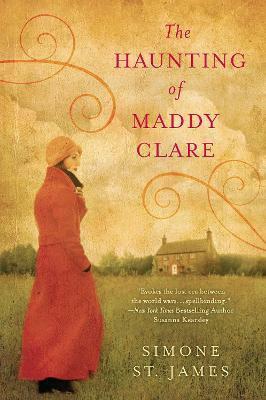 Deanna Raybourn, author of the Julia Grey series and of The Dark Enquiry "One foggy evening not long ago, I lit a fire in the fireplace, brewed myself a cup of tea, settled in and began to read The Haunting of Maddy Clare. When I looked up again, my tea had gone cold, the fire was out, and hours had passed in an instant. The deliciously eerie, traditionally gothic story grabbed me with its first sentence and didn't let go until the very last, as though Maddy herself reached out from the page and drew me in, insisting that I, along with ghost hunters Sarah, Matthew and Alastair, not rest until I discovered what happened to her one terrible night in the dark and foreboding English countryside. Author Simone St. James gets everything right in this ghostly tale, and I'll be standing in line to buy whatever she writes next." Wendy Webb, author of The Tale of Halcyon Crane "Fast, fun, and gripping. Kept me up into the wee hours." C. S. Harris, author of the Sebastian St. Cyr mystery series "I don't believe in ghosts, but I believe every word of this fast-paced, compelling story."